It might be a competitive fight, it might not be. It might be an exciting fight, it might not be (it will be!) And it might be a long fight, it might not be – but what Saturday’s WBC heavyweight title fight between champ Deontay Wilder and challenger Chris Arreola will be, is a value for money fight. Cheapest tickets at The Legacy Arena in Alabama? Yours for just the almost insulting price (insulting to the two fighters and the promoters who, let’s face it, need to earn a buck) of $20.00! Yes, the critics have moaned and groaned about this fight, saying it is a poor match-up between a peaking, and quite lethal, heavyweight star-in-the-making who has never tasted defeat, against a tough but faded slugger whose last fight saw him come up positive for marijuana; the win being demoted to a no-decision. You know what, to heck and back with these grumble weeds! What we have on Saturday, as Wilder’s trainer Jay Deas was at pains to point put when speaking with AL.com, is a fans’ fight; a “schoolyard” scrap between two warriors who know each other too well for it to be a good thing for one of them. “If you’re not a Chris Arreola fan, you’re not a boxing fan,” Deas said recently. You know, he’s right. For all his faults, the Mexican/American puncher with skills is never – really never – in a bad fight, entertainment-wise. In there as he now is with the unofficial KO King himself, how can Arreola possibly let us down in the thrill stakes? He can’t. This fight will be don’t blink fury for however long it lasts. And at just $20 to be there live and in person, beer and/or hotdog in hand, there will be nobody demanding a refund once the smoke has cleared. Can Areola smoke the way the great Joe Frazier did? Maybe. This is the 35-year-old’s last chance (he said recently he doesn’t even know how much his paycheque will be, yet he cares not – the green belt being a possession he agonisingly craves) and any man drinking in the last chance saloon can be one to be avoided. 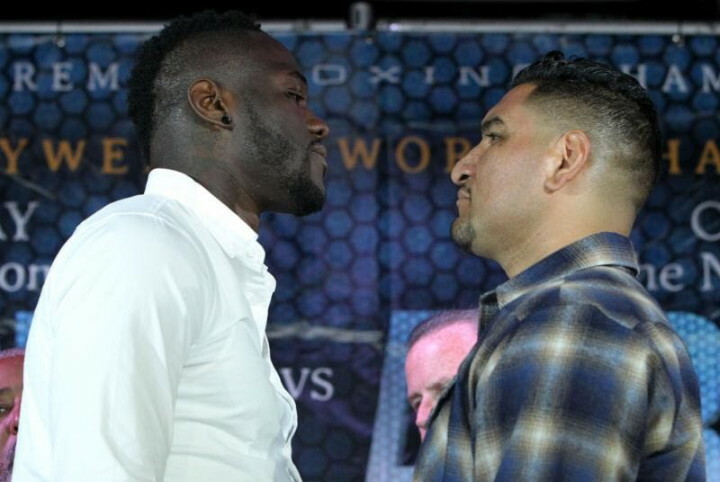 It’s too late for Wilder to swerve the Arreola menace now, and vice versa, and it’s too late for those fans who have bought a ticket to avoid taking advantage of a banging bargain. If only all the exciting rumbles cost the fans so little.